cryptonaut-in-exile: The Bells of Saint John - "Run, you clever boy, and remember." The Bells of Saint John - "Run, you clever boy, and remember." Who is Clara Oswald? What does the Doctor need to remember? Is it Clara reminding the Doctor of something, or is there another agent behind her mysterious nature? Now that book, Summer Falls. 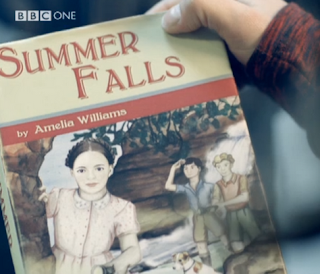 Amelia Williams as an author implies Amy Pond may have something to do with this story arc, or it could just be a shout out to departed favorite? But I think you don't use that name, and have a character on the cover that looks Clara-ish without it meaning something more. And, as the A.V. Club write up points out, there seems to be some significance to the chapters as they related to Doctors. The kid with the book is on chapter ten, and Clara tells him he's really going to love chapter eleven, and that it will bring a tear to his eye. This obviously pours fuel on the Matt Smith-is-leaving rumor fire. The Great Intelligence has obviously not made its last appearance of the season, which -- if nothing else -- give us a hope for the eventual return of the Yeti! I don't really have a theory to expound, any speculation on my part as to what he's got in mind, and what role he might have to play going forward would just be foolish, so I'll spare myself from getting egg on my face, but am very curious what other folks think he's got to do with the mystery of Clara, if anything? Well, I really enjoyed the episode. The transition from one Companion (or Doctor) to a new one is always rough. I like the 11th Doctor and I love Clara so that was enough to make me happy. I found the Amelia Williams reference confusing because Karen Gillan clearly said she didn't want to make return visits to the show. That is also the reason for the quite unbelievable statement at the end of Angels Take Manhattan when The Doctor said he could never see the Ponds again after the Weeping Angels sent them back in time. That always seemed like a statement that brought more questions than answers. As far as the Doctor not being able to see the Pond/Williamses again, that never really made any sense to me. I gather they're really not coming back, so I'm groping for explanations why they've got folks reading Amy's book? And what's the tear-jerker in Chapter 11? Is that a reference to what's already happened? Or what's to come? So many questions. I just hope it all makes sense in the end.